HELLO my friends! I'm so sorry I didn't have a Friday Cool Stuff post up for you last week - Julia and I went to California to visit some old family friends. We had a lovely time, but I really don't know how the Californians do it - it was SO HOT. A friend of mine told me on Facebook, that really, we shouldn't consider ourselves heat wimps, but just 'highly advanced people' with an extra refined survival sense. It was so hot. I have been busily compiling books for the past couple months, thinking I was going to get a Summer Reading List up and that never happened. Then I was going to write an End of Summer Reading List and that too is seeming unlikely. How about Cozy Books to Read This Fall? Does that sound nice? I think it does. I'll see if my husband will provide some Very Helpful Commentary. But here's something. I was going to to put it on my list, but I took it on my trip and began reading it, and I was trying to think of a post for today and so here you go. 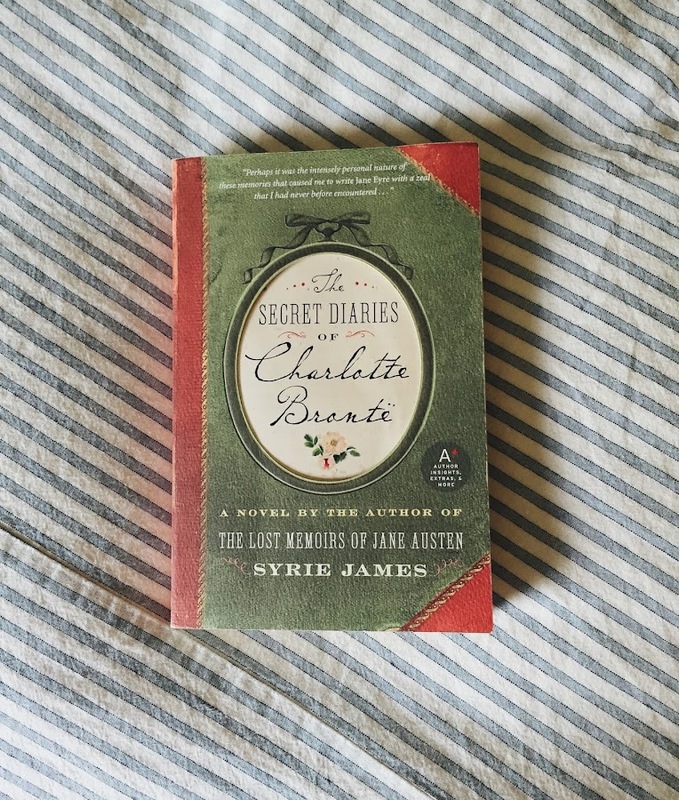 'The Secret Diaries of Charlotte Bronte' by Syrie James is just FABULOUS and I've been tearing through it at a great pace. It's wonderful! I've had such bad luck finding a book that will really hold my attention and this one is performing that task marvelously well, I'm really delighted with it. If you're a fan of Brit Lit, or All Things Period English, you will adore. Especially if you're a Bronte fan. (hey Bronte fans, how excited are you about this news??) The book's story is based on a great deal of research gleaned from biographies and communications written by Charlotte Bronte herself to her best friend Ellen Nussey - some five hundred letters that were written over a 24 year period. The entire book written by James is based on historical fact and it's just riveting. I've been reading it every chance I get. I realized that a lot of the books I'm putting together for my Autumn Reading List have a similar theme somewhat, and this book also definitely fits within the genres of those other books. Once the kiddo is back in school, I'll get that post up I SWEAR. I am so ready for fall. I mean, I'm always ready for fall, but I'm REALLY ready. That California heat scared the tar out of me and I just want to be cold and wear sweaters. Let's revisit this topic again in January, shall we? When it's miserable and grey and depressing? I haven't read this one. I read another historical fiction called Becoming Jane Eyre a few years ago, but I didn't care for it. The Brontes were so interesting. I shall have to check this one out! my sweet D, I think you will LOVE this. It's really good! That brother of theirs. What a train wreck! I am a huge fan of ANY reading list-you could name it "Just Because..." and I would be thrilled. Speaking of books, I have my second shipment of Pioneer Girl from Amazon, the first book had crimped pages and oily fingerprints on the dust cover. The second just has the oily fingerprints. I am stymied by this, how is this happening? Seriously, I enacted a whole CSI episode looking at the fingerprints. I googled this, but haven't seen any one reporting this problem, am I the only one? I guess I should stop trying to get the deal, and spring for actual bookstore prices at Barnes and Noble. Sorry about the vent--but as fellow book lovers, I imagine you can feel my pain! That book DESERVES to be in pristine condition. I hope you get a beautiful copy! I would love to read this book! Thanks so much for letting me know about it! I love anything Bronte! I need to finish some books first but this is definitely on my TO READ list! Sounds fantastic. And the cover is so darling.